India is known as the land of many rivers, and agriculture is considered as one of the most prominent occupations in the country. India has 4000 odd dams which are built across various rivers, natural lakes, tributaries and reservoirs. Wondering why these mammoth structures are built, well some are meant for power generation, some of industrial purposes, few for irrigation and drinking water and few others as rain catchment. These huge and mighty structures stand tall to serve people and bring them closer. Each one of them is unique in its own way, whilst some of them have been considered as the best examples of engineering marvels which impound the many great rivers of the country. Scroll down and check out some of the best dams in the country which you can visit. The dam is constructed over the rivers of Bhagirathi and Bhilangana in the state of Uttarakhand. The Tehri dam is the highest dam to be built in the country which stands at an height of 260.5 m and is surrounded by mountains which adds on further to its overall beauty. The dam is also considered as the second tallest dam in the world. The construction of the dam began in the year 1978 and was completed in the year 2006 amidst a lot of protests by the locals and environmental activists. The dam stands on the Krishna river, on the borders of the states of Telangana and Andhra Pradesh. The dam is the country's largest masonry dam which is built in stone and concrete, which was regarded as one of the important factors to initiate the Green Revolution in India. The massive dam looks extremely captivating against the backdrop of green mountains. You can go up a stairway which would take you up to the banks of the reservoir. The dam looks even more beautiful during the night as the place is lit up and forms a reflection against the waters. The Bhakra Nangal dam is the highest straight gravity dam to be built in the world. Built across the river Sutlej, it is situated on the borders of Punjab and Himachal Pradesh. The V-shaped dam provides water for irrigation purposes to the nearby regions along with electricity. Located in the state of Odisha, the dam takes pride in being of the longest man-made dams to be constructed. The entire dam runs for more than 25 km, with the main section extending to 4.8 km. The dam was built in the year 1956, and is a major crowd puller as it is also home to large variety of flora and fauna. Previously known as Stanley Reservoir, the Mettur dam was built by the British in the year 1934 and is the largest dam in the state of Tamil Nadu. The water retained in the dam is used for irrigation and is supplied regularly to the various farmlands of Salem, Erode, Namakkal, Karur, Tiruchirappalli and Thanjavur. The water flowing upstream from the dam gives rise to the Hogenakkal Falls. 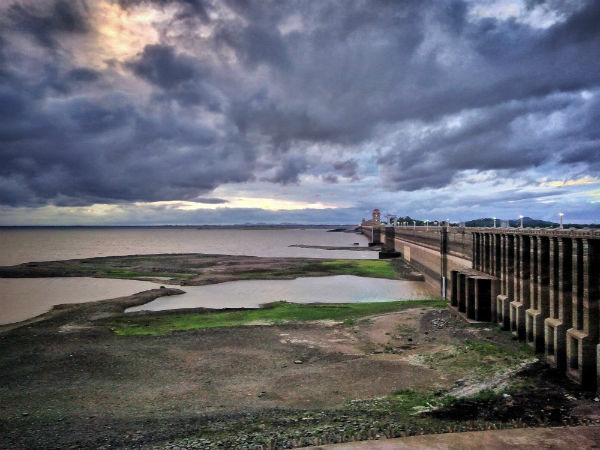 The Tungabhadra dam is the largest dam in the state of Karnataka, visit the dam during the monsoons and get a chance to witness its magnificence when all its 33 gates are opened to release water. The dam looks even more beautiful when viewed during the night with its illuminated walls and gates. Located amidst green valleys, the Idukki dam is Asia's biggest arched dam and stands tall between the hills of Kuravanmala and Kurathimala. The nearby Idukki Wildlife Sanctuary adds to the charm of this place. Many species of wildlife animals can be found here like the sambar, deers, elephants, jungle cats, wild boars, tigers and bisons. Built across the river Narmada at Narmadanagar in Madhya Pradesh is Indira Sagar dam. It is a multi-purpose gravity dam which has a 688 m long diversion tunnel along with twenty radial gates and a power house which can generate approximately 1000 megawatts of electricity. The Bilaspur dam is located on the Banas river in the state of Rajasthan. It was built in the year 1999, for the main purpose of supplying drinking water to the nearby cities of Ajmer and Jaipur. The dam is also considered home to many migratory dams and is fondly called the life line of Rajasthan. One of the most important dams in eastern India, the Maithon dam, is built across the Barakar river. The dam houses an underground power station which is one of a kind in the entire region of Southeast Asia. The water held by the dam leads to the formation of the Maithon Lake, where one can enjoy a boat ride.